Here's your quick and easy midweek romance tip! 3. With a toothpick, carve your sentiments. 4. Glue the package shut. When he gets it, I'm sure he'll think, "Oh. Peanut Butter Cups. Nice." But when he decides to eat them, he'll have a surprise waiting for him! Sometimes, its the little things that hold a relationship together--so don't discount these simple midweek romance tips! Enjoy! I love this idea!! I may have to try this for my hubby one day!! This is my husband's favorite candy! How do I open that package without ripping it to shreads? OH, and I'm working on a ransom date! So excited! This is a fun idea. I think we could even leave a sweet treat on the counter (on a plate) for him to stumble upon at some point - spelling out your message in M&Ms or even with his breakfast cereal or something. My husband works nights, so I can leave him something in the morning (with his cereal), and have him find it when he gets home! What a great idea. It's even great for those of us who are uncomfortable with sharing feelings. Oooo, I get the hebee Jebees just thinking about it. 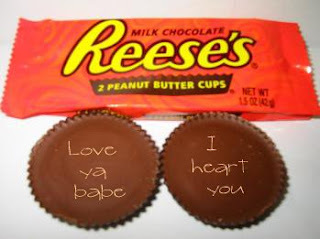 Very cute idea, my hubby loves Reese's too! Thanks for stopping by myblog today! I LOVE this idea!! How fun!! DID it! He loved it! Thank you! as always you are a genius! That is so CUTE! I did have to think about the last time I picked up a treat for my husband! Poor guy! Isn't it funny how a little goes a long way? Just showing someone that you were thinking about them enough to bring them home a little something can really make the day seem that much better. Thanks for the reminder! How do you keep coming up with such sweet, creative ideas?! Your hubby is so blessed to have such a loving and thoughtful wife. You are a genius!! 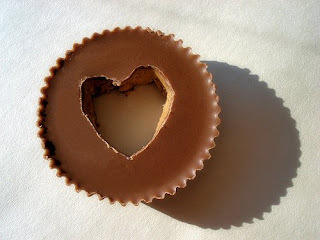 LOVE the peanut butter cup idea! I love this idea ! I'm going to try it soon. Great blog by the way. This looks like a really awesome blog!! I'm your newest follower, lol....got here from a comment you left on Michelle's (Lollypops and Lizards) page...you've got some awesome ideas!! What a cute idea. Since our little dude arrived I haven't told my husband nearly enough how great he is! We're so tired and busy, but that's no excuse. Thanks for the inspiration! Such a cute idea! THese are my hubby's favorite candies too......I wonder if he would notice if I wrote anything on them??? I'll try it anyway! Reeses is my Husbands favorite candy! Thanks for posting this cute idea!